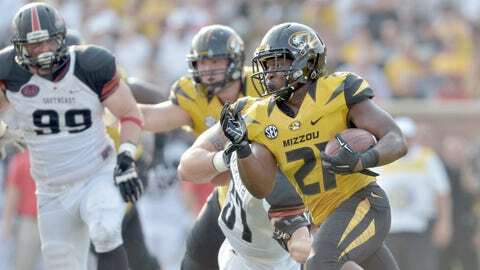 Can Missouri run the football versus Florida? On paper, the Florida run defense should have an advantage over Missouri’s rushing attack. The Gators rank No. 15 in overall rushing defense, allowing 97.8 yards a game. Conversely, the Tigers are No. 112 nationally rushing the football, registering a paltry 119.4 yards per game. Missouri’s below-averaging rushing totals do coincide completely with Russell Hansbrough’s health this season, or the lack thereof. He’s played sparingly due to an ankle injury, and has only come back recently with semi-good health. Against Florida, the Tigers cannot ask true freshman Drew Lock to do everything. It needs balance on offense in order to take pressure off of the young signal-caller. Additionally, a strong rushing attack with Hansbrough and Ish Witter could slow down Florida’s vaunted pass-rushing group. If Missouri stalls in the ground game (especially on first and second-down situations), Lock will be forced into difficult third-down conversion attempts. In this scenario, Florida’s defensive ends can pin their proverbial ears back and get after Lock with reckless abandon. Fortunately for Missouri, it appears as if the run game has perked up a bit. In the victory over South Carolina, Witter and Hansbrough combined for 141 yards on 28 carries. The duo will likely need to put up similar statistics if Missouri is to pull the upset.